After an exciting start to the 2019 Freeride World Tour in Hakuba, Japan last month, the tour now jumps the Pacific Ocean to Kicking Horse Mountain Resort in British Columbia, Canada for the second stop of the year. 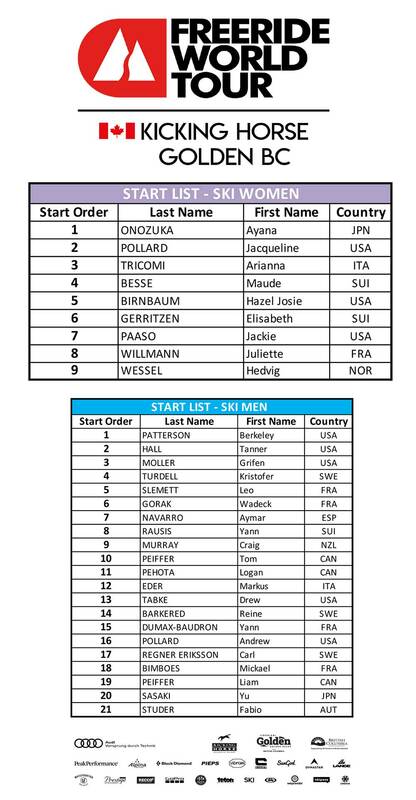 With Conditions looking good in BC, the contest has been confirmed to start tomorrow, Tuesday February 5 at 7:45AM Pacific Standard Time (4:45PM CET). The winners in Hakuba, Markus Eder and Arianna Tricomi will be looking to extend their lead — but they’ll face tough challenges from the rest of the field. Eder has FWT rookies like Tanner Hall (how funny is it to call the Ski Boss a rookie?) and Tom Peiffer hot on his heels in the rankings, while the Swiss duo of Maude Besse and Elisabeth Gerritzen will challenge Tricomi on the women’s side. We’ll have the livestream link here on Downdays — make sure to drop by tomorrow afternoon to watch the show. And don’t forget to cast your bets on the winners in the Peak Performance Prognostic Games!